Scientists report the latest data from the Upper Gulf of Mexico, and the results aren’t good. This image of the Gulf of Mexico in the summer was created by the Moderate Resolution Imaging Spectroradiometer (MODIS) instrument on NASA’s Aqua satellite. Reds and oranges represent high concentrations of phytoplankton and river sediment. The National Oceanic and Atmospheric Administration (NOAA) announced today that this summer’s dead zone is the largest everrecorded, measuring 8,776 miles. This is more expansive than the nearly 8,200 square-mile area that was forecast in July. Since monitoring began 32 years ago, the average size of the Gulf’s dead zone measured in at 5,309 square miles. The Gulf of Mexico hypoxic or low-oxygen zone, also called a dead zone, is an area of low to no oxygen that can kill fish and other marine life. It’s primarily caused by an excess of agricultural nutrients that flow downstream and into surface waters, stimulating harmful algae. To record the new measurements and assess the severity of low oxygen levels in the Gulf, scientists from the Louisiana Universities Marine Consortium (LUMCON) embarked on their 31st mid-summer hypoxia research cruise in July. Even with reported numbers as large as they are, the team of scientists said the entire area of the dead zone couldn’t be mapped due to an insufficient number of workable days on the ship. There was more hypoxia to the west, and the measured size would have been larger if there was more time for researchers to work. Preliminary reports from the United States Geological Survey (USGS) align with the observation, estimating that 165,000 metric tons of nitrate–about 2,800 train cars of fertilizer—and 22,600 metric tons of phosphorus flowed down the Mississippi and Atchafalaya rivers into the Gulf of Mexico in May. There are many alternative ways to farm using sustainable agriculture, Rabalais added. Those types of practices can reduce the flux of nitrogen, and they can be economical and beneficial to farming communities. The Gulf’s hypoxic zones are caused by excess nutrient pollution, primarily from human activities such as agriculture and wastewater treatment. Farmland runoff containing fertilizers and livestock waste is the main source of the nitrogen and phosphorus, which stimulate an overgrowth of algae that sinks and decomposes in the water. The resulting low oxygen levels are insufficient to support most marine life and habitats in near-bottom waters, posing a serious threat to the Gulf’s fisheries. The Gulf dead zone can slow shrimp growth, leading to fewer large shrimp, according to a study led by Duke University. Additionally, the total catch of shrimp could suffer, meaning higher costs at the marketplace and loss of jobs for fishermen, equating to an economic ripple effect on fisheries. The cause for much of this fertilizer pollution is related to a high demand for meat in the U.S., according to a new report by Mighty Earth, an environmental group. The report blames a small number of businesses for practices that are “contaminating our water and destroying our landscape,” citing areas of native grassland in the Midwest being converted into soy and corn fields to feed livestock. 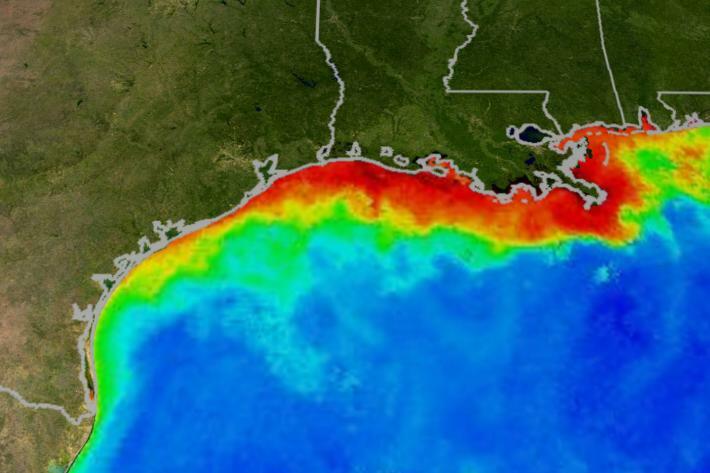 In its action plan for the Gulf of Mexico hypoxic zone, the Mississippi River/Gulf of Mexico Hypoxia Task Force recently extended the deadline until 2035 for achieving the goal of a 1,950-square-mile dead zone, which would be roughly the size of Delaware. The task force also agreed on an interim target of a 20 percent reduction in the amount of nitrogen flowing into the Gulf of Mexico by 2025. Shrinking the annual Gulf of Mexico dead zone down to that size, however, will require a much higher 59 percent reduction in the amount of nitrogen runoff that flows down the Mississippi River, according to a study published in Proceedings of the National Academy of Sciences. Using computer models, researchers analyzed what it would take to reach the longstanding goal of cutting the size of the Gulf hypoxic zone by about two-thirds, concluding that while the goal is still attainable, reaching it will require “bold new approaches” applied on a large scale in upstream agricultural areas. “The bottom line is that we will never reach the action plan’s goal of 1,950 square miles until more serious actions are taken to reduce the loss of Midwest fertilizers into the Mississippi River system,” says University of Michigan aquatic ecologist Don Scavia, lead author of the paper. The study reveals that hardly any progress has been made to reduce the amount of nitrogen runoff. Concentrations of the nitrogen compound nitrate found in rivers are the same today as in the 1980s, and despite more than $28 billion in government spending to reduce nitrogen runoff, there hasn’t been a significant reduction in the amount of nitrate washing into the Gulf of Mexico. Although nitrogen has historically been considered the main nutrient driver of hypoxia in the Gulf of Mexico, a “dual-nutrient strategy” of reducing both nitrogen and phosphorus appears to be the most prudent management approach, Scavia and his co-authors reported.